Get cracking on your fabulous Kahului trip! Let the experts at Orbitz coordinate the best-value flight and hotel deals. Want to save up to $857*? Just combine your bookings by selecting your desired airfares, hotels, rental cars and experiences. Not only that, you've got plenty of freedom. Mix and match from 500 airlines and some 500,000 accommodation options worldwide. There are endless possible options to create your own remarkable vacation, whatever your interests, budget or needs. It doesn't matter if you're taking a quick break or a full-blown overseas adventure — if you keep booking with us you'll receive instant Orbucks! It's a simple program that's full of perks and extra savings! Obtain platinum or gold status for perks at Orbitz Rewards VIP Hotels. How do you do that? Just book four nights for gold membership and 12 nights for platinum in a calendar year. And, how do you redeem Orbucks? It's a piece of cake — just use your Orbitz Rewards points on your next booking. You don't have to wait until you're on the plane staring at the flight path to learn where Kahului is — let us point you in the right direction. You'll discover it approximately 95 miles east of Honolulu, the state capital of Hawaii, and roughly 6 miles southeast of Wailuku. Traveling is about meeting people, so why not make friends with some of the 26,000 locals who reside in this corner of Maui? In Kahului you'll encounter a range of interesting tourist attractions, such as the Maui Arts and Cultural Center and the Maui Nui Botanical Gardens. Try to swing by all of them! There are plenty of little treasures to be found strewn along a shoreline. So, if you're planning to spend a few hours at Kanaha Beach Park, watch out for little starfish and weathered pieces of driftwood. Need some more options? Regulars at The Dunes at Maui Lani get excited about their course, and you will too. But wait, that's not all! It's seldom dull studying the living quarters of people from the past. Take a guided tour of Bailey House Museum and try to visualize how this historic residence once was. Few things are as fun as exploring a new destination with your own wheels. If you're after car rentals in Kahului, Orbitz is here to help. Arriving by plane? Thrifty Car Rental at Kahului Airport is the best place to head to after collecting your baggage. You'd better not leave it till the last second! 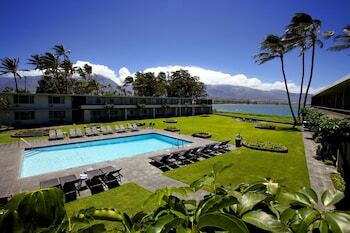 There are just 7 hotels in Kahului. Book through Orbitz today to avoid missing out. While arranging your island escape, take a look at the amenities and services at the Courtyard Maui Kahului Airport and The Old Wailuku Inn at Ulupono. Hoping to jump on a plane to Kahului? If so, you might be keen to know a little about the most convenient airport, Kahului Airport (OGG). It lies 2 miles to the east of the downtown area. Get ready to land and start exploring soon after! Travel to Kahului for its unique character and style. That said, you also have celebrated attractions right around the corner! Haleakala National Park draws tourists from all nations. Kula, only 18 miles from Kahului, is a handy base when stopping by this unforgettable attraction. Taken out your passport, booked your trip but now can't go? Don't panic — we make canceling a piece of cake by not requesting a fee.^ Act promptly and your selected airline and hotel might do the same!